First Lady Gets Face-To-Face With Heckler : The Two-Way At a Democratic fundraiser in Washington, D.C., a woman interrupted Michelle Obama with shouts about rights for gays. "Listen to me or you can take the mic, but [then] I'm leaving," the first lady said after confronting the woman. "You all decide. You have one choice." The heckler was escorted away. 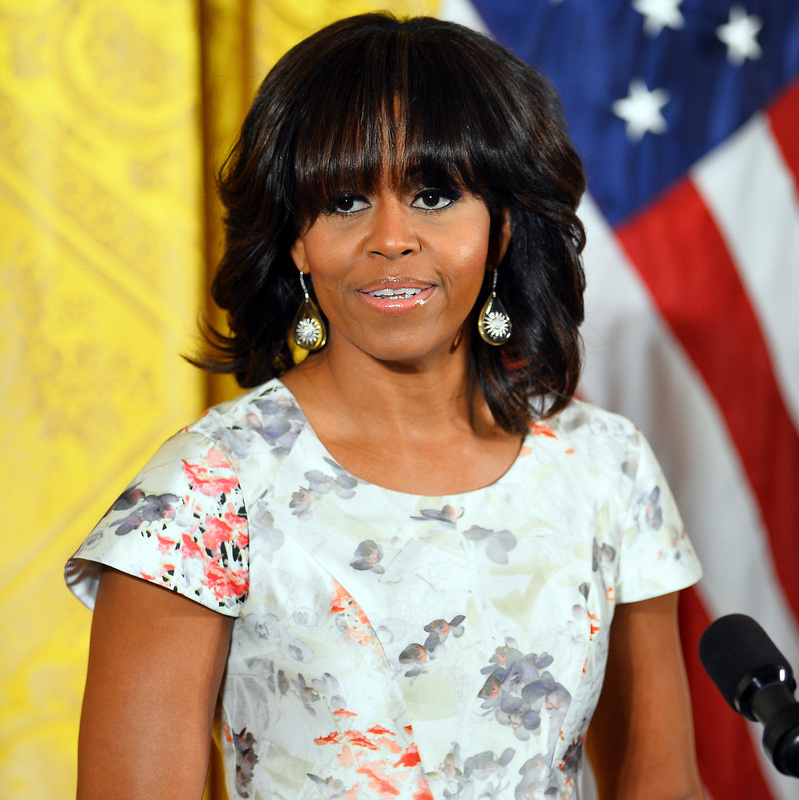 First Lady Michelle Obama at the White House on May 9. CNN has posted clips from a video taken by GetEQUAL in which you can see and hear some of what happened when one of its activists heckled First Lady Michelle Obama at a private fundraiser this week. "Listen to me or you can take the mic, but [then] I'm leaving," first lady Michelle Obama said to a heckler Tuesday evening at a Democratic Party fundraiser in Washington, D.C. It was a "rare face-to-face encounter with a protester," as The Washington Post says. It ended with the heckler being escorted from the event held in the backyard of a private home after others among the 200 or so people there started shouting thing such as "you need to go!" The heckler, later identified as Ellen Sturtz from the GetEQUAL campaign that advocates for lesbians and gays, told the Post that the first lady "came right down in my face. ... I was taken aback." Sturtz also told the Post she paid $500 to attend the fundraiser. "[The] crowd started shouting that they wanted [Obama] to stay.
" 'You need to go!' said one woman near the protester. "Loud applause in response to this comment." Update at 11 a.m. ET. Audio. Buzzfeed has posted an audio clip. You can hear the first lady when she's at the microphone — saying "one of the things that I don't do well is this" — but not when she approaches the heckler.